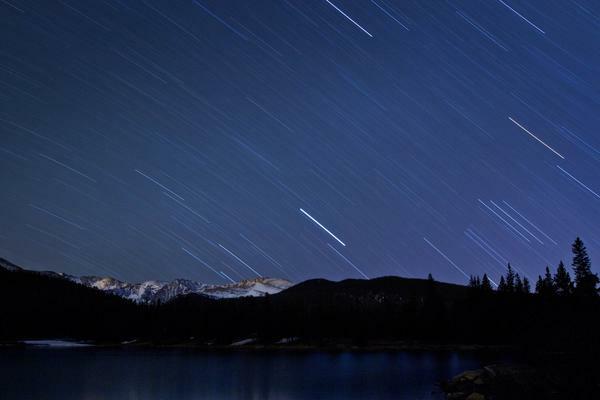 The stars at night streak across the sky with the motion of the earth spinning on it's axis on a quiet, peaceful and chilly night at Echo Lake in Colorado in late April. If you would like a print of this photo, you can purchase it from the gallery. The photograph was taken with a half hour exposure on my Canon 7D at 160 iso and an aperature of f 8.0. I hadn't tried an expsoure that long before, and found a couple important things. First, it gets very dull sitting and waiting for an exposure to take place. My mind also started wondering what animals were around. It was so dark that I could barely see much around me. The moon wasn't a factor since it wasn't out, and I didn't want to turn on a flash light so I could keep my night vision. It takes about a half hour for the eyes to fully see the expanse of stars in the night sky, and there is something about seeing that beauty that makes me want to see it even more. It also gets darn cold at times, but I found layering clothing and using some hand warmers kept me pretty warm. I hadn't anticipated the cold though and was lucky I keep some spare clothes in the car. The worst was what to do with the time while the camera was recording the photograph. I learned to entertain myself and experiment with the name of the spot this photo was taken. Echo Lake is very accurate. I started with a simple, "Hello!" yelled out to anyone around that might hear, and the trees and rocks answered as they echoed back. First it echoed from straight in front of me, and then it swept from the right all the way around to the left at about 180 degrees. It was as if I had found the surround sound of stereo echoing. I played a bit more with longer and longer phrases seeing what could and couldn't be understood as the echoes drifted off in the far dark distance. As the night drew on, I found a bit of sophmoric joy in a few chosen expletives. Even at 41 I evidentally can still be turned into a 9 year old.